To celebrate National Poetry Month, we are sharing poems from our collection throughout April. 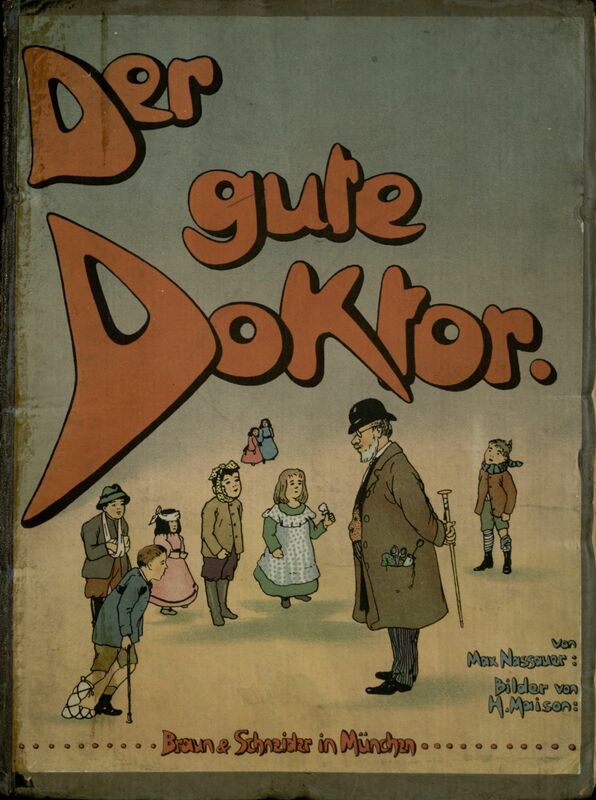 Cover of Der gute Doktor. Click to enlarge. This week, we’re celebrating national poetry month with some medical children’s verse. Der Gute Doktor:ein Nützlich Bilderbuch für Kinder und Eltern (The Good Doctor: a Useful Picture Book for Children and Parents) is a colorful children’s book written by Max Nassauer, a German gynecologist and writer.1 The first edition was published in 1905; our copy is the 9th edition, probably printed in 1926. The book contains fourteen cautionary tales with medical morals. While the stories, and especially the illustrations, are amusing, they certainly aren’t lighthearted. The consequences of poor health habits are unpleasant. One boy falls ill after walking through the rain and snow. Another gives himself a painful stomachache because he is too embarrassed to use the bathroom at school. Sometimes the repercussions for ignoring the doctor’s orders are far more tragic. In one tale, a stubborn young man refuses the doctor’s medicine and dies the next day. 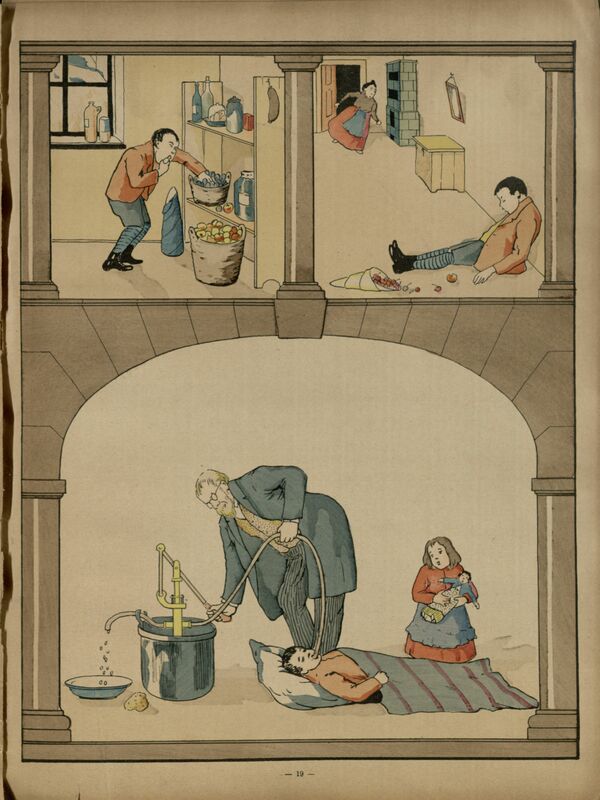 I found little information on the history of medically-themed children’s tales, but Der Gute Doktor falls into the larger tradition of didacticism in children’s literature. 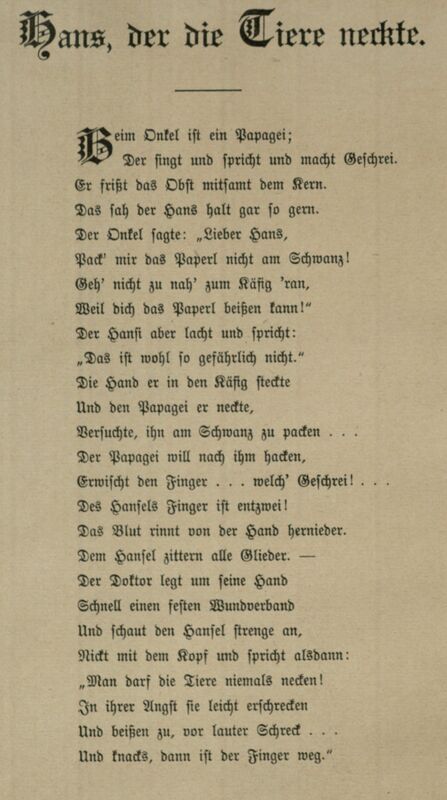 Grimm’s Fairy Tales, translated from oral stories between 1812 and 1857, include cautionary tales, such as Little Red Riding Hood.2 Der Gute Doktor especially brings to mind another children’s book written by a German doctor, Struwwelpeter by Dr. Heinrich Hoffman, published 60 years earlier.2 Struwwelpeter includes similar tales of unruly children suffering for their bad behavior. 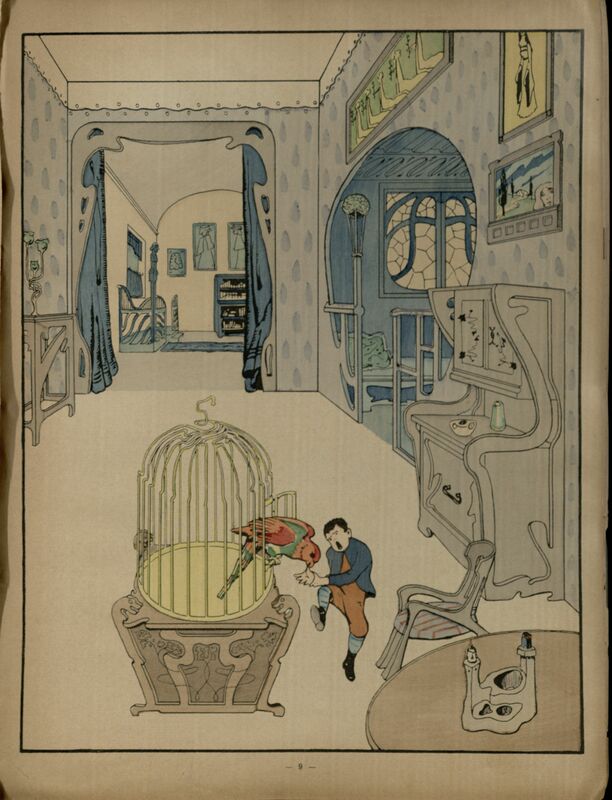 The tale of Augustus, a boy who refuses to eat his soup and starves to death, would easily fit among the tales of Der Gute Doktor.3 Struwwelpeter was hugely popular and is one of the most well-known German children’s books.2 Undoubtedly, Nassauer was familiar with and influenced by this iconic book. 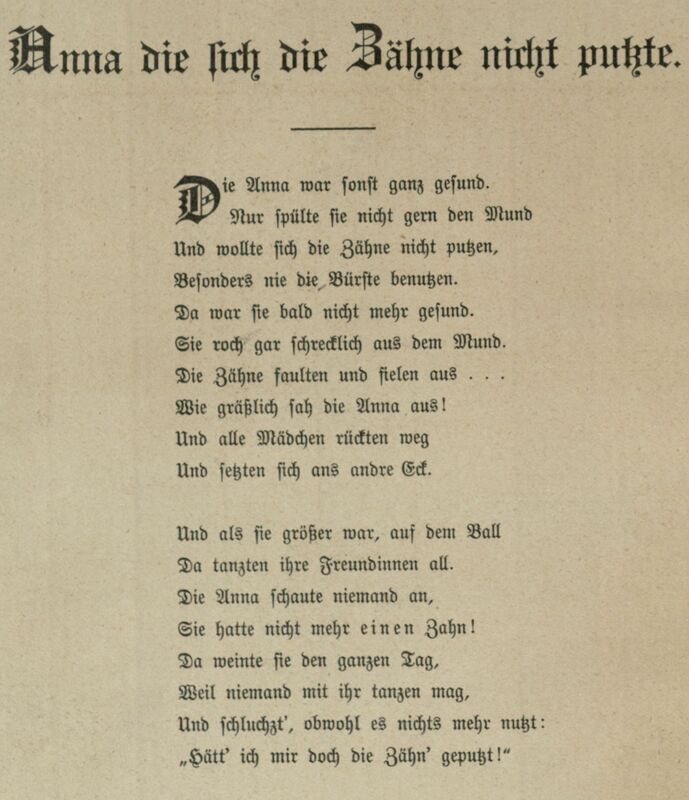 The original German text. Click to enlarge. cherries grow in the garden. Oh, how fruit is healthy! Makes the cheeks red and round. That was unripe and green. Well, how bellyache catches him! Until of cramps he suffered. He cursed the pips in fact! That the mother comes running. Franz would be living nevermore. Franz, the Pip Swallower. Click to enlarge. The original text. Click to enlarge. who sings and talks and screeches. It eats the fruit along with the pip. Hans liked to watch this. Don’t touch the parrot by its tail! Hans’ finger is in pieces! Blood runs down from his hand. “One mustn’t tease the animals! Hans, who teased the animals. Click to enlarge. especially not using a tooth brush. And soon she was not healthy any longer. She smelled awful from her mouth. And sat down at the other corner. all of her girl friends were dancing. She did not have a single tooth left! Anna who wouldn’t brush her teeth. Click to enlarge. 1. Gerabek, Werner E. (1997). Nassauer, Max. New German Biography. Retrieved April 5, 2014 from http://www.deutsche-biographie.de/pnd116884150.html. 2. Chalou, Barbara Smith. (2006). 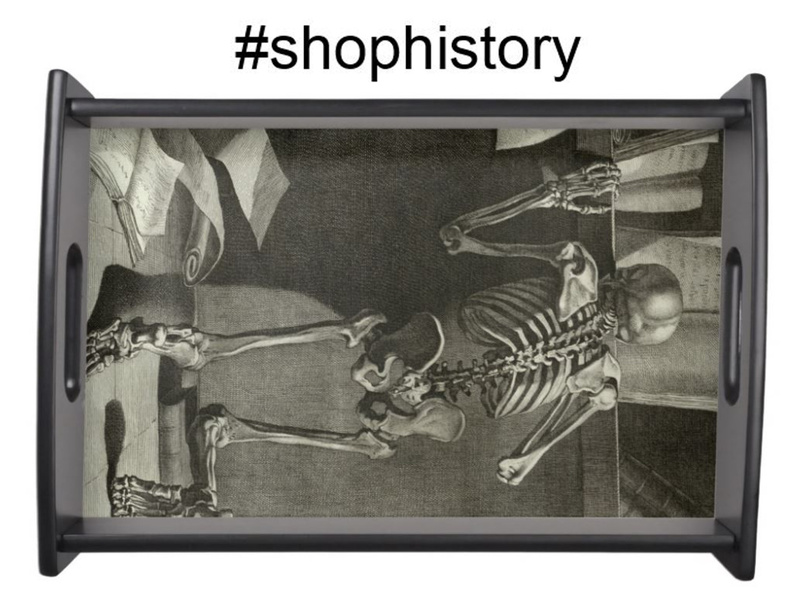 Struwwelpeter: Humor or Horror? Lanham: Lexington Books. Retrieved April 5, 2014 from http://books.google.com/books?id=2UE2AAAAQBAJ&source=gbs_navlinks_s. 3. Hoffman, Heinrich. 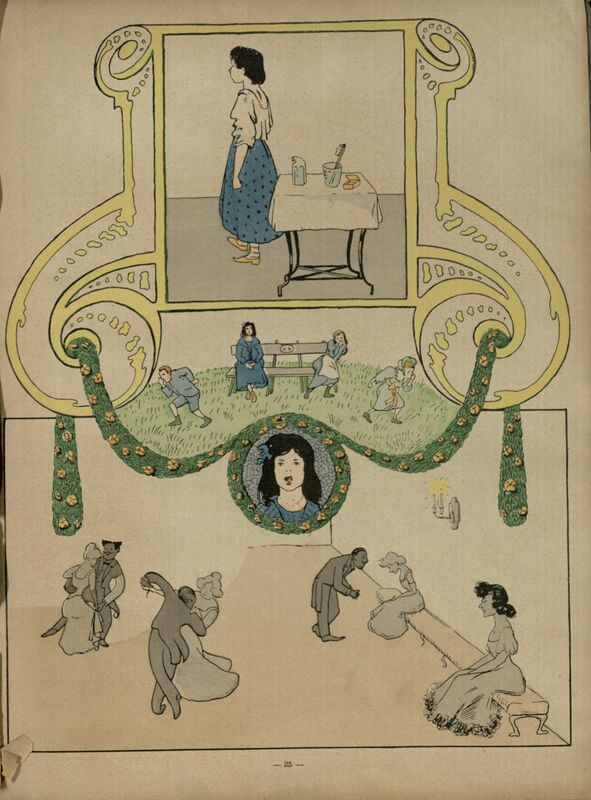 (n.d.) Struwwelpeter: Merry Tales and Funny Pictures. New York: Frederick Warne & Co. Retrieved April 5, 2014 from http://www.gutenberg.org/ebooks/12116.